Who will be the winner? There's Goku and his fellow student Kuririn, a little Shaolin monk with big ideas. There's Yamcha, Goku's old enemy. There's Ran Fuan, who's not afraid to use her good looks to win a match. There's Kaiju Giran, a rubbery monster with shark teeth and pterodactyl wings. There's Namu, an Indian mystic on a mission. But most of all, there's Jackie Chun, the mysterious old man with the greatest kung-fu ever! It's the ultimate battle of youth and power versus age and skill! 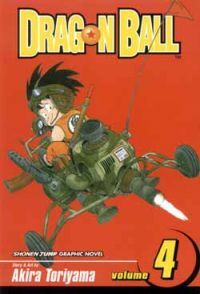 DRAGON BALL ©1984 by BIRD STUDIO/SHUEISHA Inc.